Shanghai wins again! China’s greatest city, already number one in cancer, bird flu, and pig rivers, has the fastest internet in the middle kingdom at 4.70 Mbps – equalled only by Taiwan ‘province’ – according to search engine Qihoo 360. Embarrassingly, Beijing and Hong Kong* are far behind our glorious city by the water, at 3.50 and 3.36 Mbps respectively. Shanghai’s internet alacrity might explain why the People’s Liberation Army (allegedly) chooses to base its elite cyber-warfare teams in the city. *Qihoo’s criteria for speed is unclear, as other reports suggest that Hong Kong’s average download speed is closer to 10 Mbps or even 44.03 Mbps (the same test reports Shanghai at 12.13 Mbps and Beijing at 9.65 Mbps). 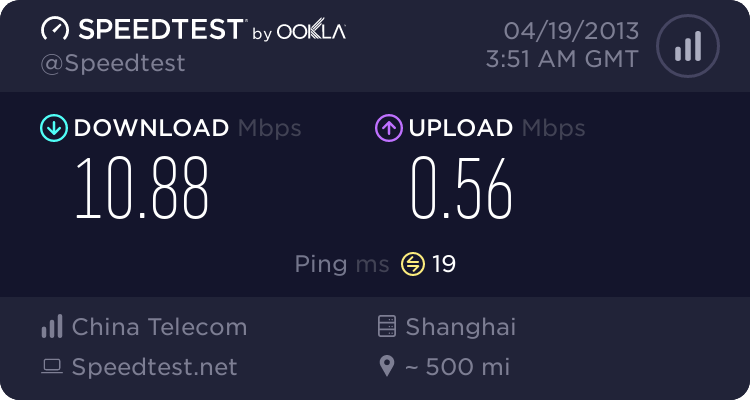 Testing Shanghaiist’s internet connection with Speedtest.net returned a result of 10.88 Mbps, make of these results what you will, I have no idea anymore.